I am intrigued. I read various posts from Facebook groups, blogs and various forums on the internet and am constantly amazed by some of the questions posed and resultant discussions. There are many questions about saving money and bargains to be had. But is it really a bargain if you did not intend to buy it and more so if you have no idea of what you are going to do with it? 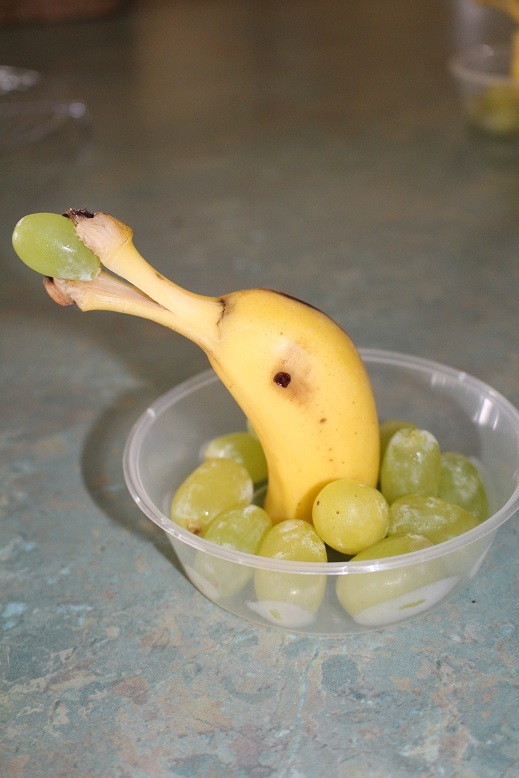 An example is, “Help, I bought a box of bananas for $5, what can I do with them?” Invariably, there are lots of useful responses and I sincerely hope that the person manages to use them wisely and does not end up wasting their money. It is even more odd when I read, “What else can I use shampoo for? I have 4 bottles in the cupboard.” I am tempted to reply with, “Use it to wash your hair”. It seems that people stock up on an item and then want to use it up as quickly as possible. I want to make things last as long as possible. I think too many people are seduced by the crowd – shop for a bargain, stockpile, use it up, downsize, declutter. Whatever the catchcry of the day, they seem to feel the need to jump on the bandwagon. It is no wonder they feel confused. My advice is to think independently, decide what works for you, make your own choices, forge your own path and don’t be sucked in by the crowd. The only things I buy are what I know I will use. I buy larger quantities of items where I have to travel some distance or out of my way simply to avoid having to do that every week. I have enough food to feed us for weeks, or in some cases, months. Fruit and vegetables are bought locally each week so I try to buy only what I need in an effort to eliminate any waste. If there is cheap produce, I will buy it if I have the time and skills to prepare and store it. What is your experience? Do you stockpile or keep the bare minimum? Have you changed your shopping habits/philosophy over time? If you are on Facebook you will be familiar with the dozens of recipes that seem to hit your newsfeed every week. Most of these barely rate a cursory glance from me. Even the ones that look interesting never actually end up being made as they are often special occasion treats or similar to something I already make. However, last week I saw a food post which caught my eye so I had to try it for myself. I cannot find the original Facebook post but here is my version which I think was a pretty good replica. The girls were here for the weekend and they were pretty pleased with their treat for morning tea. 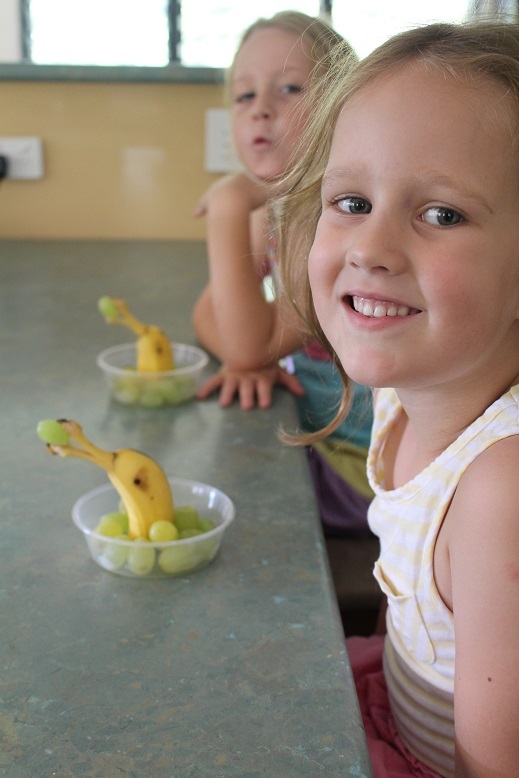 It is a simple and fun idea for a healthy snack. I didn’t get back to post this last night. Miss O and Izz have been staying for a couple of days so the food focus has clearly been about them. They enjoyed shopping at Simply Good yesterday and discussing many of the different fruits, nuts and grains that we bought. Miss O was keen to practise her recently acquired spelling skills to read the names of the ingredients on the storage buckets and fill them up when we arrived home. They picked pumpkins and tomatoes as well as collecting eggs. It is great to see them understanding where their food comes from. 4 year old Izz wanted an anatomy lesson on how the eggs get out of the chickens!! 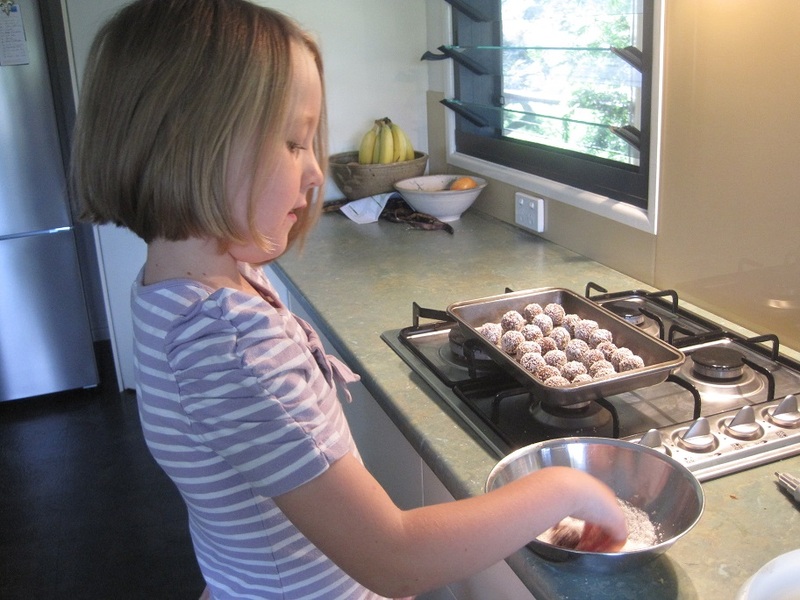 Tomorrow we are going to a picnic with extended family so I made some choc fruit nut balls and Miss O helped by rolling the balls in the coconut. Apologies for the brevity of this post but I have been working on our Ireland itinerary and looking at ferry timetables and rental car details. I had dreamed of getting a blog post written last night but life got in the way. As you all know, I try to make sure that meal preparation is done ahead of time because of the late hour that we arrive home. I did quite a bit on the weekend so it has been a very simple matter of heating and eating the past couple of nights. Last night I cooked a pot of rice and made Mexican Bean Pie ready for our dinner tonight. I will just need to cook the vegetables when I get in this evening. 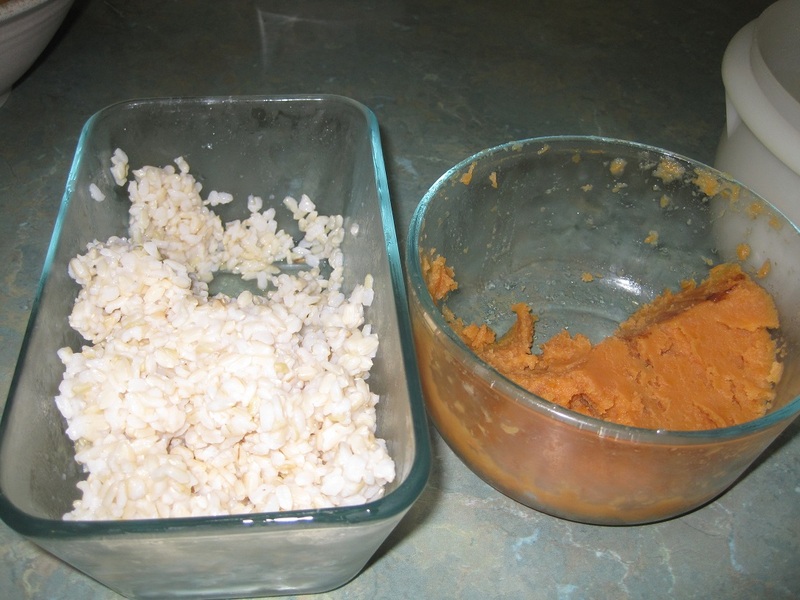 The pie is my own invention and has 2 ingredients – refried beans and rice. Mix quantities of each together, spread into a pie plate or shallow casserole dish, top with breadcrumbs and grated cheese. I heat it in the microwave then finish the topping under the griller. I use a gluten-free version of topping using almond meal, flaxseed meal, and spices. The choice is yours. Tonight will be a new ‘Foodie Friday’ post in which I will focus on growing at least some of your own food and the benefits it provides. Thanks, once again and I look forward to many more posts and comments. 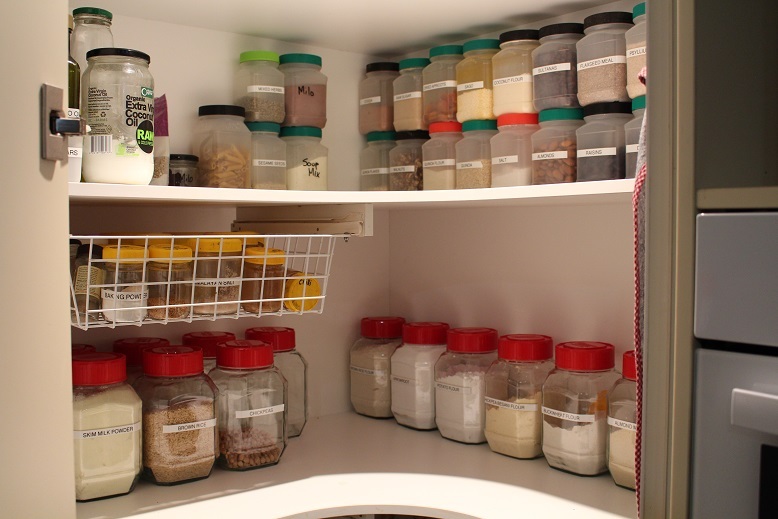 In addition she added this link to her post about the contents of her pantry which is very well stocked. Sarah also added that she always had access to eggs and milk. 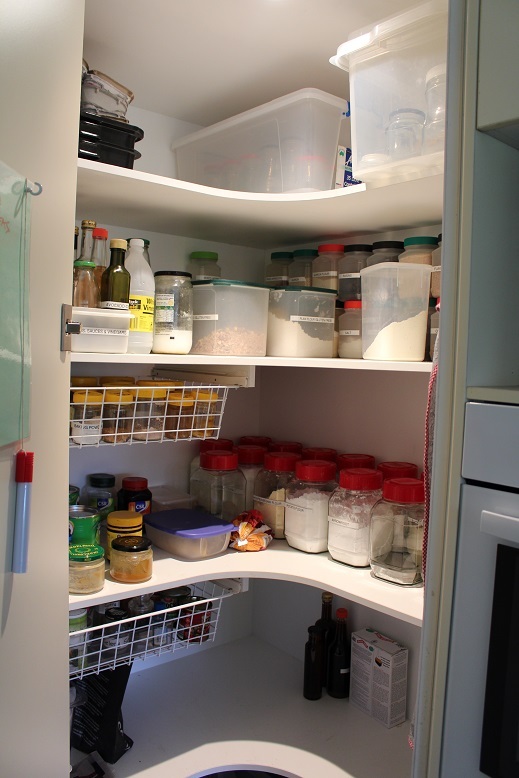 Whenever you are trying to use what food you have on hand, it is important to look at the perishable items first. These will go rotten or become unusable soonest so it is important to use them. The first meal that comes to mind is Cheese Souffle. This is a recipe that my mother would make, probably when ingredients were a bit thin on the ground but I really loved it and do make it from time to time. Here is the recipe. Soak breadcrumbs in milk. Separate eggs. Beat egg yolks. Add all other ingredients. Beat egg whites until stiff and gently fold into mixture. Pour into greased ovenproof dish and bake for about 40 minutes at 180 degrees. I would shred some of the cabbage and grate a carrot. Toss together with ‘French Dressing’ made from oil and lime juice whisked together. Since the oven will be on to cook the souffle I would make sure a least one other item is cooked as well to get maximum value for money. You could make Pear & Ginger muffins for snacks. Using the gluten-free flour and other baking ingredients from the pantry make a basic muffin mix and add grated ginger and the mushy pear. HINT: Remove the seeds but you can roughly chop the pear up including the skin. You could also add a few sultanas or chopped nuts for interest. The night before you make the Cheese Souffle you could soak some lentils and then cook them ready to use. Make a lentil and vegetable lasagne using the prepared lentils, sliced zucchini and the remaining carrot grated. Cook the lentils, carrot and canned tomatoes with preferred herbs/spices. Make bechamel sauce using milk, butter and flour. Layer these with lasagne sheets and slices of zucchini and grated cheese. Top with grated cheese and bake in the oven. This can be refrigerated and reheated for a meal the next night. You can also divide it into portions and freeze. The remaining lentils could be mixed with some cooked pumpkin, finely shredded cabbage and chickpea flour to make vegie burgers. These could be served with sweet chilli sauce on a bed of wilted spinach. I am not familiar with miso soup paste but from my research I would make miso soup and perhaps add some udon noodles for added substance. Tuna mornay is another meal that comes to mind. Flour, milk, butter, grated cheese and the tin of tuna form the basis of this meal which is served with rice. I generally add frozen peas and corn kernels to the mixture. Since Sarah does not keep meat on hand or have a great deal of fresh fruit or vegetables at the moment there is a limit to what can be created without compromising her nutritional status. Contrary to popular opinion, fruit and and vegetables are not outrageously expensive. Remember, to only buy what you need and buy what is in season where possible. Make a plan using as many ingredients that you have and only buy exactly the quantities that you need to create the meal. 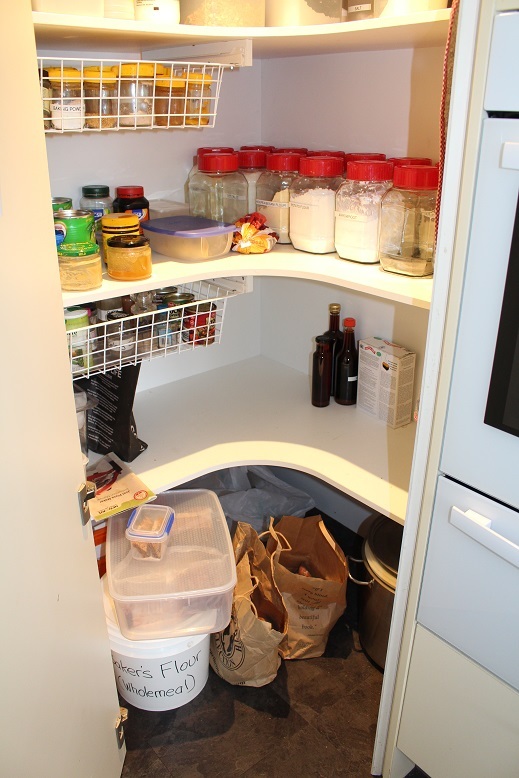 Remember to use the basic ingredients in the pantry to extend the meat and vegetables. I have done this with the lasagne and also mornay mixture. Other options could be crepes or pies where you could stretch the filling to feed extra mouths. Another option for the stale bread would be to slice it and make bread cases for pie or mornay filling. Would you you have done something different with the listed ingredients?